On September 11, the Central Elections Committee of Uzbekistan turned the green light for political parties: they can now officially launch their pre-election campaigns, which was supposed to start mid-September. The actual parliamentary elections for seats in the Legislative Chamber of Oliy Majlis (the parliament) are scheduled for 21 Dec 2014. In many democratic nations the launch of pre-election campaigns trigger a noticeable societal movements in public life. But Uzbekistan is different. Although more than two weeks passed since the campaign are officially launched, there is almost no single indication of the upcoming political event, despite the fact it is the most significant event of its kind this year. The CEC has so far dryly reported, “This event triggered a heightened interest and is becoming a subject of close attention on the part of socio-political circles, experts and analysts, as well as foreign mass media outlets.” Perhaps the Uzbek authorities are organizing these elections only for the sake of creating the visibility of multi-party democracy in foreigners’ eyes. “The diplomatic missions of the Republic of Uzbekistan abroad are hosting a thorough explanatory campaign to inform on the upcoming parliamentary elections and the electoral system enjoyed in the country that meets highest democratic standards,” the Uzbek CEC’s official website boasts. The political parties’ websites are not generous with official information either. Should the voter feel the desire to familiarize himself with the new party programs, he must brace for disappointment. For example, the websites of the Movement of Entrepreneurs and Businessmen – Liberal-Democratic Party of Uzbekistan (UzLiDeP) and People’s Democratic Party of Uzbekistan are still featuring programs that date back to 2005 and 2009, while Milliy Tiklanish Party’s website still has the party program from 2011; the Adolat Party’s website is not available altogether. Perhaps the party programs will not undergo updating, because what is written therein is already marvelous? Indeed, what else could be added to the programs authored by those politicians who are spearheading technological modernization and prosperity of economy under the Uzbekbashi’s leadership? After all, it is that very Uzbekbashi, whose leadership is supposedly leading Uzbekistan toward democracy, respect for national values and traditions, for developing small and medium business and agriculture. Interestingly, the Uzbek legislation does not prescribe haste as far as political parties are concerned. To be more specific: each party must collect at least 40,000 signatures in support of their participation in any elections and turn those in before October 12; this requirement must be met before they can launch a pre-election campaign. The parties can then start compiling lists of their candidates after passing this hurdle. The CEC provided forms for those signatories on September 17 only. There is no information available to shed light on the locations and manners of collecting those signatories at this time. At least no collectors of signatures can be seen in Tashkent. As such the collection of signatures should not pose a serious problem for parties, because the number of party members in each party easily exceeds the number required above; at least the parties themselves claim it is so. For instance, the Milliy Tiklanish Party claims it has 176,676 members, People’s Democratic Party of Uzbekistan enjoys the support of 368,214, while UzLiDeP has about 230,000 members. We are unable to say anything regarding the Adolat Party, since there is no source to collect information about the party – its website is inactive. Unfortunately, it is obvious that the collection of signatures and the upcoming elections will be held in the usual “forcibly voluntary” manner, given the Uzbek population’s utter apolitical attitudes, with the use of administrative recourses. There is no room for even doubting that designated parties will certainly collect the necessary number of signatures, which will consequently be recognized as legitimate. 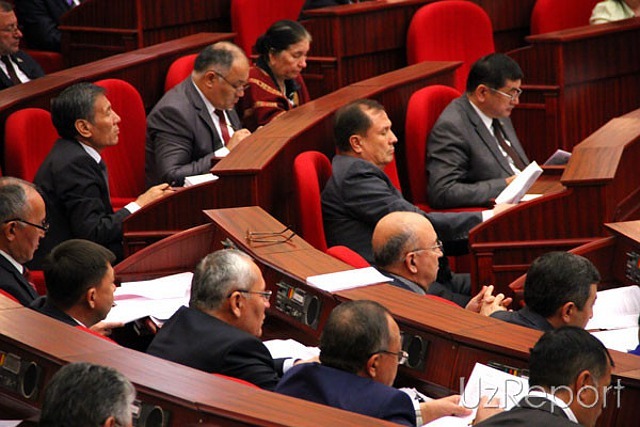 Said lists of signatures in support of this or that party’s participation must be delivered to Tashkent no later than October 12. The CEC will then establish the legitimacy of signatures, and qualifying parties may start nominating candidates by October 17 and will stop doing so on November 6. The law provides for 10 days for the CEC to consider the candidates and approve or disapprove of them. Consequently, the official period of campaigning can be launched after November 16, i.e. only a month or so ahead of the actual elections. Meanwhile, Uzbekistan’s population seems to be completely oblivious as to the upcoming important political event. The candidates and parties, whose roles are predetermined by the higher echelons of power, are like puppets in a well-staged puppet-show, so fighting for MPs’ support is not even on the agenda. On the other hand, voters do not care who they elect – the parliament plays no role in their daily lives anyway. The voters are not aware of the current parliamentary events and legislative actions; scanty and standard reports about roundtable discussions or parliamentary sessions make the electorate drowsy, not informed. Even if the “popular” parliament does adopt realistically democratic laws, they are later rendered inefficient by bylaws later adopted and published nowhere. “One comes to the polling station on the elections day and has no idea who to vote for. I usually vote for women, because they are few [in power]. If there are no women in the [candidates] lists, then I vote blindly,” a Tashkent resident shares her thoughts. Elections have been “blind voting” in Uzbekistan for the last 20 years, i.e. since the formation and establishment of Islam Karimov’s authoritarian regime in late 1990s. Over the same period of time, any and all of President Karimov’s political opponents were either convicted for trumped up criminal charges or exiled. Throughout all these years, elections in Uzbekistan remind theater pieces staged for foreigners, Europe, the USA, i.e. that very “the West,” which insist on democratic reforms. You want democracy? There you go: we have many political parties, of which five even made it to the parliament, and they are fiercely competing among themselves for popular support. “The multiparty system in the current Uzbek parliament is fake; it is a facade for pleasing foreign eyes. The [supposed] competition for influence among the parties is a cunning use of props. The independence of the legislative branch of power is a lie completely devoid of reality. After all, the parliament adopts those laws that were drafted and approved of by the government and those close to the president. No matter how wonderful these laws sometimes are, their application is subject to the whims of administrations at various levels,” says a Tashkent-based political analyst, who wishes to remain anonymous. The next presidential elections in Uzbekistan will follow the parliamentary elections in question after only 90 days. The issue of presidential candidates, whether real or not, remains to be resolved. What is certain is that the sole sovereign of Uzbekistan, Islam Karimov who had been a member of the USSR Communist Party since 1964, will win those elections. After all, he has been “winning” them for the last 25 years.